My Shimano LX rear has finally changed its last gear. I was going to upgrade to a XT for my 04 Norco Rampage. However my buddy just got a complete X.7 setup for 80 from Jenson. He couldnt shut up about it. So any suggestions? I need something soon, I got a back up bike, but I like the hardtail for DJ. I read the reviews for the X.7 and 9 and couldnt really see a huge difference in the 2. But compared to Shimano how are they? Thanks. 80 includes the shifters? If you can get used to using only thumbs to shift, it's great. I loved my SRAM x.9 setup on the Norco Six. It took some getting used to initially, but it requires very little maintenance compared to my Shimano XTR setup. The shifts were also much more precise and crisp. I loved it. Oh, and the knuckle is fixed, so no flopping up and down and banging on the chainstay. sram shifters are waaaay cool. the best out there. however the x.7 derailleur is a piece of **** in my opinion. go for the x.9 if you can affort it. or just get the sram rocket shifters and an xt rear derailleur with rapid rise. thats what i run. Ya it was actually 89 for the rear D and the shifters. But I looked on ebay and I think I can get the same thing for about 15-20 cheaper. So go with the SRAM??? they call you a gansta if you spend big bucks on a pair of 20" chromes. well shlt.... i got a pair of 26's! Would not go back to anything shimano again! I have the SRAM X.9 rear derailleur, X.7 rear shifter (no X.9 in 8spd). It's a really nice combo. The X.7 shifter was only $30, but still very crisp and well made. I put a little more money into the derailleur hoping that the X.9 is worth the extra $30 over the X.7, but I'll never really know. The SRAM derailleur/shifter combo is definitely better than any Shimano I've used. Total thumb shifting rocks. And losing the big loop was a great side benefit too. BUUUUUUUUUUUUT - BANG CLANG BANG - I am tired of them banging my chainstays or cassette - have tried an X.7 and X.9 - and they shift well (Nowhere near as 'smooth' as Shimano, but solid and precise!) -no banging, so Im going for it. Okay - drama aside, I have never had a performance problem with Shimano (Because I wlaways used XTR) - they are all dinged and scratched and still working, but I need peace and quiet so thats my motive. ALSO - I would like to keep my HT 8 speed and I hear SRAM has an 8sp version of the X.7 shifter -- anyone have one?? Hard to find?? Last edited by Huck Banzai; 01-22-2006 at 11:07 AM. I have one bike with X9 & pg990 cassette the other is X7with a cheaper Sram cassette.I really don't notice any differance.The one with the cleaner better lubed chain always works better. Ok cool, great feedback. So now I guess my next question is I saw on the SRAM website that the X.7/9 has 8/9 speed capabilities. Iâ€™m running an 8 at the moment, so with the sifter do you select whether 8 or 9? Or do they sell 8/9 specific shifters? My friends x7 flipped upside down the spokes caught on it and it ripped the whole derailier to pieces and bent the replaceble drop out, i think i am going to go for a roadie cogset and derailier(yes they are exactly the same but much shorter caged), short cage and narrow range of gears is what a lot of downhillers seem to be going for. Shimanos have some play in the shiting pully because it it suposed to line up with the gear, sram shifters are crap in my opinion. I am keeping away from sram because of that reason. I saw on the SRAM website that the X.7/9 has 8/9 speed capabilities. do you select whether 8 or 9? Or do they sell 8/9 specific shifters? yeah, that is very misleading. I went through this just a month ago. I found out after speaking with a tech at SRAM that they discontinued the 8spd X.9 trigger shifter. I spent three weeks searching for a leftover, no luck. They do offer the 8spd X.9 in gripshift, hence the standard marketing blurb on most web sites "Available in 8 or 9spd". In my experience, which is extensive...the online retailer will say 8/9spd, then you add it to your cart and the 9spd is the only option. The 8spd trigger exists in X.7, but it's not easy to find (SEE BELOW). Also, keep in mind, if you have an 8 spd cassette you must have an 8 spd shifter. I hear SRAM has an 8sp version of the X.7 shifter -- anyone have one?? Hard to find?? I highly recommend you send an email to Erik@BalleRacing.com. He answered all my questions, ordered the X.7 8spd for me and sold it for $30. Great guy, and a very fair price. I got it within 2 weeks. Last edited by RTM; 01-22-2006 at 04:26 PM. I'm talking twist shifters.Way back when, I used an 8 speed shifter with a 7 speed cog.You just set the derailluer stop right and don't use the last click on the shifter. I have a X7 derailleur and it works great. I am Shimano free at last. 7-8 speed jump added a cog at the same spacing - 8-9 speed added a cog with narrower spacing. IE - an 8 speed cassette is (one cog) wider than a 7 with the same spacing, 8 & 9 speed cassetes are the same width but with more or less cogs, so with different spacing, the 'other' shifter dont woik! I have a complete SRAM set up on my hard tail. 2004 XO rear, XGen front, and X9 shifters. This set up is the sweetest shifting, low maintenance rig i've ever ridden. I still feel like I should have gone w/ the X9 because I don't believe the price difference is worth the cost. I've read alot of the rants about SRAM in the forums and it seems to me that alot of the problems people have are the result of improper installation. If you do go to SRAM, follow the instuctions to the T and you will be a happy camper. That's gonna leave a mark ! i run complete x-7 components on a 8spd HT and shifting has been surprisingly crisp even under heavy mud/clay runs. my buddy is always having to tune his lx components, but i've only had to adjust my derailleurs twice for cable stretch since i got my setup 4 months ago. Hey, SMT...I don't claim to know this as fact, but after seeing and dealing with both at our shop, I was wondering why you feel the 9 is more durable. I see a dramatic difference in construction and quality from the X5 level to the X7, but it looks mainly like a weight issue between the XO, X9, and X7 series. Is there some evidence supporting this X7/X9 durability issue? 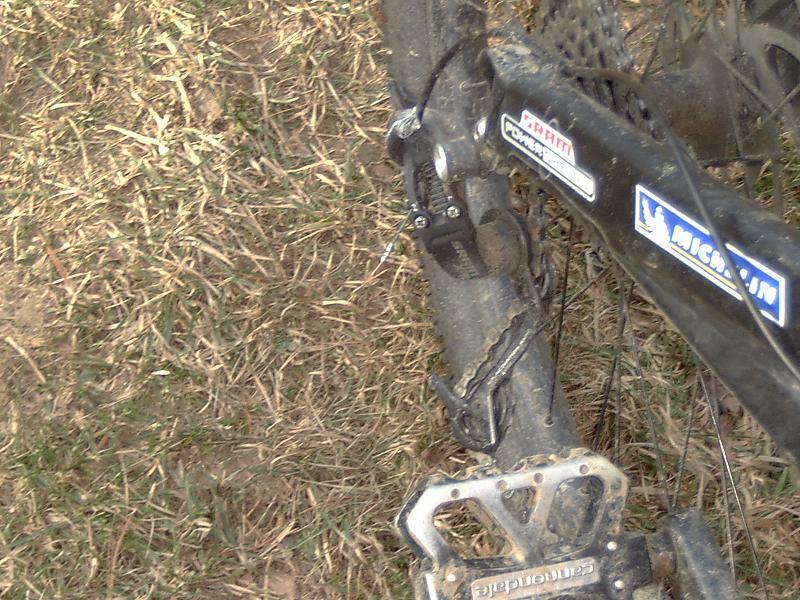 I run X7, and I have destroyed one X7 rear derailleur, but nothing would have survived the rock that I hit IMHO.